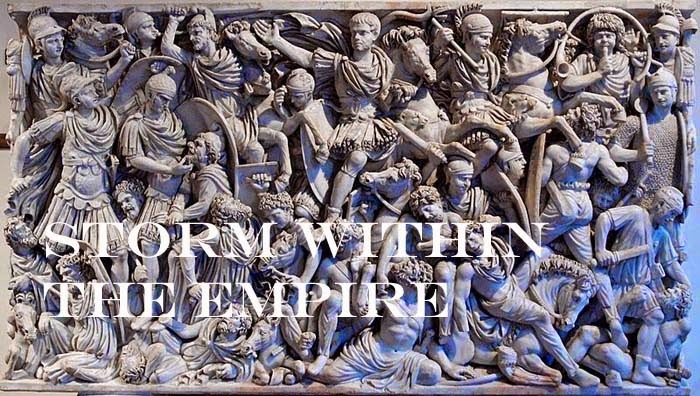 Storm within the Empire: Project Rome – Seleucid vs. the Pre-Islamic Nomad Arab. Project Rome – Seleucid vs. the Pre-Islamic Nomad Arab. Rebelling satraps were not the only threat to the empire of Antiochus III but it had to contend with marauding bands of tent dwellers, usually dealt with by the local governors who marshaled their militia and local mounted levy. Such a sub list does not exist, so the nomad Arab now face the guard formations of foot and cavalry complete with phalanx, elephant, scythed chariot and xystophoroi cavalry. Leading the army would be one of the local governors while Antiochus III remained in his palace to await events. 1 x general (3Kn), 1 x cataphract (3Kn), 1 x elephant (El), 1 x scythed chariot (SCh), 4 x phalanx (4Pk), 2 x thureophoroi (4Ax), 1 x Cretan archer (Ps), 1 x slinger (Ps). 1 x general (LH), 1 x light horse (LH), 1 x scouts (LCm), 4 x camel riders (3Cm), 2 x swordsmen (4Bd), 2 x archer (3Bw), 1 x slinger (Ps). As defenders, the Nomads could anchor their left on a large area of rough ground and with the difficult hills set well to the rear of the Seleucid army the open space between was an ideal killing ground. With a judicious pip score, the Nomads sprung into action to begin encircling the Seleucid left flank. On the Nomad bound following, the entire force struck the entire Greek army at one time. This did not have the desired effect as they lost two of their number. The Nomads were able to even the score at one point, but the scythed chariot cut two camel units in quick succession bring the score 2 – 4 for the Seleucid. The Nomads, again defending, were fortunate with placement of the terrain pieces that neither side looked appealing for the Seleucid. Both sides were plagued with low pip scores such that the first clash was seen on turn four. The following turns both sides were giving as good as they got, a Nomad archer downed a unit of pike, both elephant and chariot were lost and the Nomad camel troops were being cut to shreds. The final blow came with Antiochus being carried off the field giving bringing the score 4 – 3 for the Nomad Arab. The Nomads selected ideal ground for their infantry to operate from as their plans would require the mounted troops to support the infantry rather than attempt wasteful maneuvers. The terrain had the desired effect of breaking up the Seleucid battle line such that Nomad mounted troops could attack isolated units or fall on exposed flanks. The Nomads capitalized on the lethargic response from the Seleucid side (poor pip scores) to bring the score to 4 – 2 for the Nomad Arab.